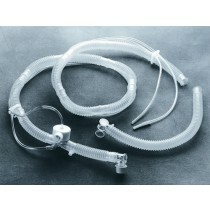 A Ventilator Circuit connects the ventilator to an endotracheal or tracheostomy tube to assist with respiratory therapy. 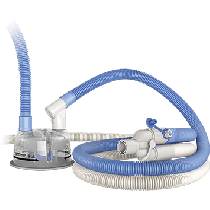 Mechanical ventilation uses a ventilator circuit to either support a patient who has breathing difficulties or completely takes it over for the patient when he or she is recovering from a traumatic injury. 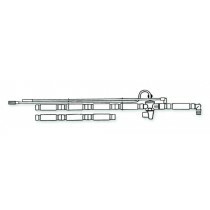 Heated Vent Circuits such as the AirLife RT114 are especially important with mechanical ventilation. Heated Vent Circuits use heated wire technology to control the amount of water vapor in the ventilator circuit. Naturally gas begins to cool between the humidifier outlet and patient. The heated wires throughout the circuit tubing ensure it remains in a vapor state and does not begin to collect moisture. Humidification prevents drying in the respiratory system and the buildup mucus in the lungs which will disrupt the airway and ultimately create an airway obstruction and can even lead to pneumonia. Therefore humidification is particularly vital in patients whose airway is bypassed during mechanical ventilation since their immune system is down. 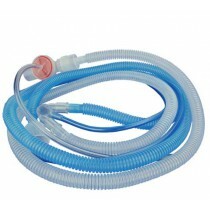 Vitality Medical also offers ventilator circuits with a built-in water chamber for humidification. The chamber is another technology to provide controlled humidification storing sterile water that automatically feeds through the heated circuits to maximize humidification. Caution: Some condensation can and still occur in heated vent circuits due to environmental settings and caregiver must check regularly. Circuits can be drained using strict handling but it should be avoided. For best practices, it is recommended to dispose of the vent circuit and replace with a new one when this occurs.